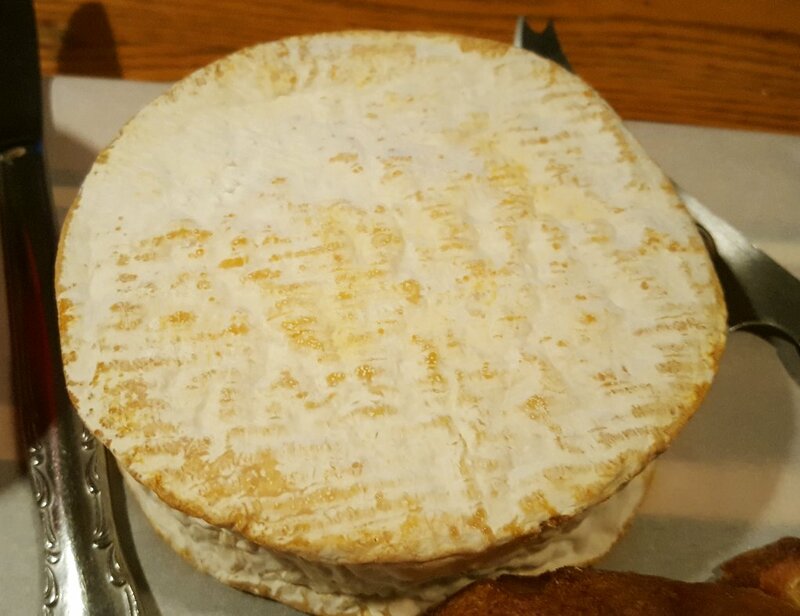 Oh my gosh, this wheel of Camembert that I made on September 19th is a thing of beauty! After all the cheese fails lately, I was actually considering giving it up. Really. But we opened this Cam last night and I have to say, I'm re-motivated to keep making cheese!!! I made a loaf of my bread last night too, and Joyce from October Farm's Rustic Olive Bread Sticks. Thank you Joyce, they were delicious!!! What a nice meal!! The Camembert stunk up the village that's for sure! That made me nervous that it could be too strong, but the taste was between mild and strong - just perfect!! Now I just have to perfect a paté recipe of my own! That Imperial Cheddar spread though...that's one store-bought cheese that still tastes good, so for now, we'll keep buying it occasionally for a treat! 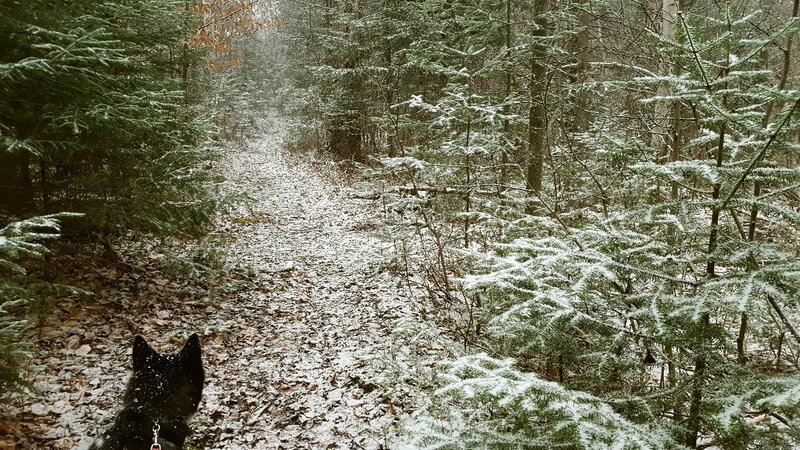 It started to snow this morning during my first dog walk. The woods are so beautiful under a blanket of snow. I can take the dogs in the woods until the new year usually, then it gets too deep to walk in. Thank you Donna :)) That cheese made me proud! :) This cheese isn't so bad regarding the time other cheeses usually take. But you do need the right Camembert molds or you won't get that nice wheel shape. One thing I've learned is that having the proper tools is a better recipe for success. The pups are very happy! 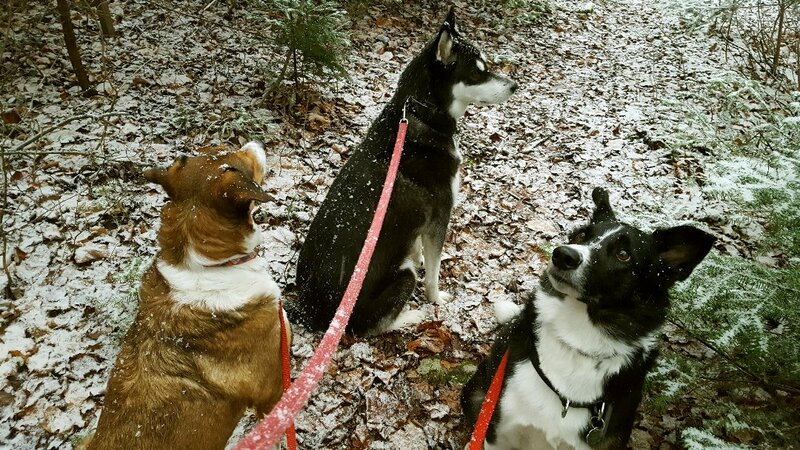 They all love the snow except for our little hound Jack who hates getting cold or wet lol! Rain - your camembert looks deeevine! i would take some of it and melt in the oven, just a little melty and then spread it on homemade toasted bread and homemade cranberry sauce! heck - throw in a heated pear as well! i love pate and have made a bunch of different ones but my fave is beef liver pate with red wine and onions in it. then i make crispy onions to go on top. i am glad you had a smashing success with your camambert and that it will give you the impetus to keep making cheese. i love cheese but just can't have too much or too often. jambaloney has stayed off cheese for almost a year now. but me? i need a bit of cheese in my life! all of your animals look so well-behaved and happy! i am super glad that you are healing up with your regimen and daily walks. that is great news! First off, congratulations on your Camembert success! I had no doubt you'd turn out some very wonderful cheeses with your try and try again attitude. (The learning curve and failed attempts occur in any craft that's worth learning, don't they?) Glad you're going to keep it up. Your morning dog walking scene looks much like what we've had lately. So far our three snows that have covered the ground have melted and this morning (after an all-night rain) we're back to green grass. Even these light snowfalls are early for us, but it's helping me settle into the long winter which I love. Happy Sunday to you and Alex and all the furry creatures in your family! Hi Mama Pea :) Thank you! You're right about the learning curve...I actually thought it would be the opposite though, I thought the "bloomy whites" would be harder to achieve over the other cheeses, but it's been the opposite. I'm glad I didn't let that latest disappointment control me though. I don't mind the snow at all right now! It'll probably all melt here too soon, there is a lot of rain in the forecast this week. It's very good pajama weather that's for sure! the cheese is a thing of beauty! glad you like those bread sticks! i have a killer smooth chicken liver pate' recipe on my blog that is the best pate' i've ever had. there is a country pate' recipe too that is very good! It looks perfect; I'm drooling. 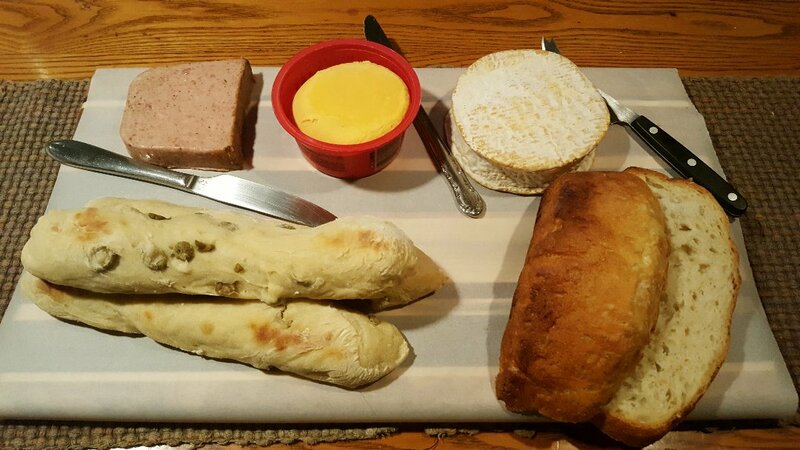 We just had a triple cream brie from France and a jalapeno hard cheese Friday at Craft Night. I had organic grapes and sweetened pecans also as side dishes to the cheeses. It's still too warm for snow out by us. It feels more like September, very strange. Darn now I have this craving for cheese again, I shouldn't have looked. Soon you will need photos to remember what the ground looked like! Thanks Stefanie :) I can't believe I made a Camembert!! I love those triple creams and I've discovered that it all has to do with cream content. If my recipe calls for 1/2 gallon of milk and 1/2 cup of cream, I can triple the cream, then reduce the milk and I officially have a triple cream Cam! :) I love nuts and fruit with cheese too, darn, I have pecans and didn't think of putting them on the tray! Hi John :) I think that the seasons are all shifting...we'll get this light snow for a few months then bombardment from January through to May. wow it's time for snow tires. Your Camembert looks amazing congrats on your success. Glad your leg is responding to treatment. Yaaaay for camembert and that the zapping pain is improving! The cover of snow looks so pretty with the dogs in the woods. We had a huge dump of snow last week, I had got my winter tires in just in time! Oh Rain, I'm so happy for you! That is great news. And the cheese looks perfect. I'm really glad you got this boost of encouragement. It's a sign to keep on going! LOL And also good news about that pain being gone. I bet you're so relieved. You live in such a beautiful area. Very relaxing for you and the dogs. BRAVA for your camembert! That's the thing with any new recipes for anything -- some work out and some go straight into the garbage. I've made my fair share of the latter! Your cheese looks wonderful, and what a skill to have for a self sufficient lifestyle. You know what goes into what you are eating and that's good, especially these days. Looking at the pictures of the dogs out walking, it looks like you are in a really nice area. They sure do seem to be happy. I'm glad you are doing better with the legs. I try to walk once a day, both to keep muscle tone and to keep my weight down. It does help you to feel better. Oh Rain, the Camembert is beautiful! I'm absolutely thrilled for you! And I'm so glad you're encouraged. I have to tell you that probably my first two dozen cheeses weren't edible and that I gave up for a couple of years. The difference is that I had chickens and pigs to appreciate my failures, LOL. Never any waste with critters. There is truly a knack to making cheese that seems only to be learned through the doing, similar to wine and bread making. You go girl! It looks great. We are getting swamped with rain. No snow yet, but somehow it would be better than flooding and tornadoes. I am doing a happy dance for you and your Cam cheese. I am so glad ypu had a success. Now you just need to find the perfect cheddar recipe. The cost for the cam is quite reasonable too. So now ypi have 2 cheeses ( cam and moz) that are great. You are doing fantastic. OH MY.....SNOW! I love snow but for us here in TN....it is too early for us for sure! Love the pics of the fur babes in the snow. Cheese...you amaze me. We had a good snowfall Saturday. In total I think about 10 cms has fallen so far. Stupid. Winter came in with a bang and doesn't look like its leaving. That is one beautiful cheese! You really have it down, girl! I am waiting for snow - I know it's coming... I don't think there is much better than a walk in a quiet, snow-covered woods. Congratulations!!!! I am SO happy for you! You have worked so hard on these cheeses and you are a real pioneer! What does Cammenburt (spelling?) cheese taste like? I don't think I have ever had it. Arkansas is definitely not the gourmet capital of the world for sure! LOL! It's gotten colder here but no snow....it is beautiful there! The heat is on here for sure. Fall was very short lived this year. Not a lot of window washing weather! The breads look delish. The Camembert looks great Rain! Huzzah! The snow makes me laugh. We have been in the mid 80's F (26 C) and are "dropping" to 40 - 50 F (4 to 10 C) tonight. Winter may finally be here. Thanks Leigh :) I'm SO happy about the Camembert! It might be a while before I try a new cheese out though...I'll stick to what works for now! I know what you mean about the learning curve...I hope I have that curve learned now! Thanks Kristina :) Yes, I rather have snow than what you guys are dealing with right now. Hope everyone is safe! Thanks Marsha, I'm dancing right with you! :) At this point, we haven't really tasted the Cheddar I made yet...the ones with the coating kind of ruined it all...but I do have three in the cheese cave. The one I was going to age for a year, we decided we'll make it a three-month Cheddar and we'll open it around mid-December. If we like the taste, I'll be set on my recipe! If not, I'll find a better one that's for sure! 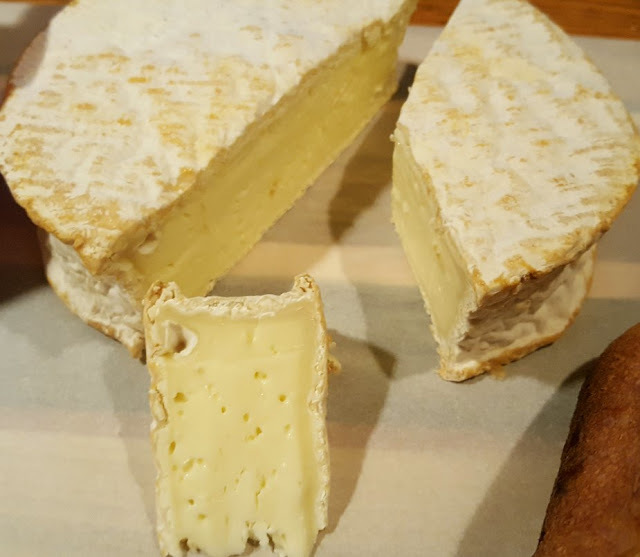 The cost is really good for a Camembert...we can't find a wheel that size, with a nice flavour, for under $15 dollars here! Thanks TB :) You're funny :)...I often complain about the cold weather, but I love the seasons a lot and I don't think I'd be happy with 26 weather in November!! :) I'm SO happy about the Camembert...have you made any? i am so proud of you that achieved your target successfully and made this WONDERFUL looking cheese .i laughed over the mentioning that you were scared to cut it and Alex did this for you how sweet! I am glad that your oil massage is doing good to your left leg . since sew years in winters either my left knee has little swelling and pain specially when i get up after sitting for little while. Your morning looks frosty though yet so magical and i love your love for life and being active all the time . i adore your postive way of thinking and investing your energy in in right thing on right times . Thank you Baili :)) I really am so happy that the Camembert worked out, it has motivated me tremendously! I really did close my eyes when Alex cut it lol...I was imagining blue and green little monsters all over the inside lol...but we all know my active imagination too! :) The weather got really cold overnight and my knee is hurting a little more, but the cold does that to me too. The dogs are loving the snow! Thank you RO :)) You should try Joyce's recipe, those olive bread sticks are easy to make and they taste so delicious. I'm going to make some more, we snack on them now! The dogs love the snow...well, not little Jack, he's too sensitive lol. Doesn't like to get cold, but the huskies and the big dogs LOVE it...they don't want to come back inside! I'm so pleased that the Camembert turned out Nik...it was really nice, now I just have to figure out how to make it more 'runny'!! Rain hi, Have been reading your blog for some time, quite impressive. Can you post the cheese making equipment and instructions to make Camembert. Was in France in the 70's and fell in love with it but cannot find here in the southeast US. Did not realize that is could be easily replicated. Also can you include information on your cheese cave, equipment humidity and temperatures. Hope your leg gets better. How I set up my cave: I don't have a specific post on this, but it's got lots of info about my "cave" in this post. Camembert Recipe: This is the one I use. I got it from a wonderful member of the Cheese Forum. His name is "Ozzie Cheese" and he posted his recipe and methods on the forum. I really recommend you check out the forum, you don't have to post but the information on that forum is priceless. I hope the links work!